Enterprise technology has come a long way. Perhaps no other innovation has had a bigger impact on how we work than the computer. In the 1970s, the typical enterprise and workers still relied heavily on paper files and fax machines, but by the 1980s word processing, spreadsheets and PC software were in the mix. Along with the 1990s came the rise of email, and in the 2000s we got an office built on the web. That brings us to today’s world, which is all about the cloud. In 2015, more and more enterprises are migrating away from on premise legacy systems to cloud-based applications. In fact, many offices today exist entirely in the cloud. How does this move to the cloud affect the way we work? And do the devices that employees are given to access their work make sense in this new cloud era? 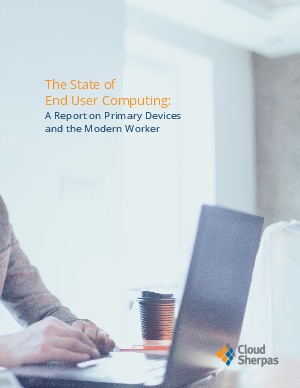 To answer these questions and better understand how these types of devices mesh with the modern, digital workplace, Cloud Sherpas conducted a survey of 500 IT managers and line of business workers. 25% of respondents wait six minutes or more every day for their devices to boot, install patches or perform other system maintenance and update tasks. 61% of end users reported that they submit one or more tickets to IT each month regarding device maintenance and repairs. Of those respondents, 46% report that they submit two or more tickets each month. 32% of IT respondents spend up to a quarter of their time responding to tickets regarding device maintenance and repairs.